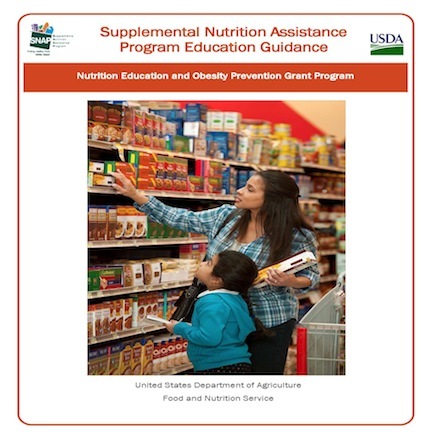 Every year, USDA issues guidance for SNAP-Ed, the “nutrition education” arm of SNAP. SNAP-Ed guidance has permitted garden-based nutrition education for a while, but it did not reimburse most of the associated expenses of running such a program. Gardening is a beneficial project that leads to the economical production and consumption of healthy and fresh food. 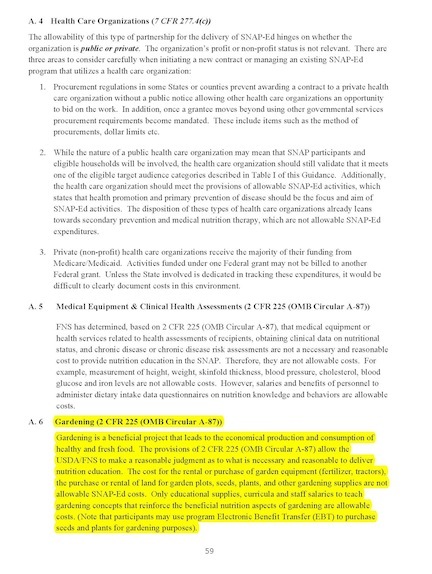 The provisions of 2 CFR 225 (OMB Circular A-87) allow the USDA/FNS to make a reasonable judgment as to what is necessary and reasonable to deliver nutrition education. The cost for the rental or purchase of garden equipment (fertilizer, tractors), the purchase or rental of land for garden plots, seeds, plants, and other gardening supplies are not allowable SNAP-Ed costs. Only educational supplies, curricula and staff salaries to teach gardening concepts that reinforce the beneficial nutrition aspects of gardening are allowable costs. (Note that participants may use program Electronic Benefit Transfer (EBT) to purchase seeds and plants for gardening purposes). 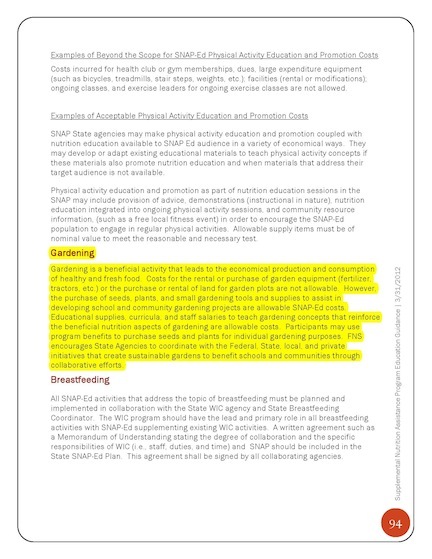 We thought that seemed unfair, since other “nutrition education” activities were reimbursable to a greater extent. The lack of equitable resources meant that most SNAP-Ed programs were not incorporating gardening into their programs. So when USDA opened up a comment period last year, we weighed in. Our colleagues at Community Food Security Coalition, Farmers Market Coalition, and the New York City Department of Health and Mental Hygiene all echoed our concerns in their comments. 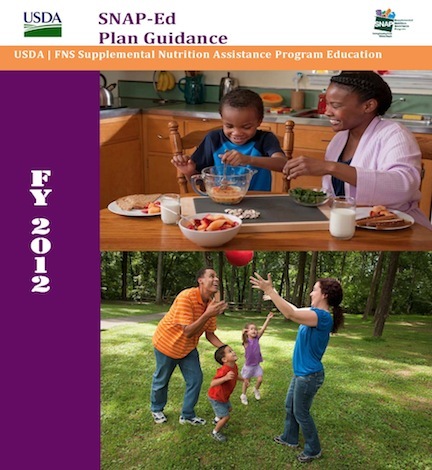 On March 30, 2012, USDA published new guidance. Gardening is a beneficial activity that leads to the economical production and consumption of healthy and fresh food. Costs for the rental or purchase of garden equipment (fertilizer, tractors, etc.) or the purchase or rental of land for garden plots are not allowable. However, the purchase of seeds, plants, and small gardening tools and supplies to assist in developing school and community gardening projects are allowable SNAP-Ed costs. Educational supplies, curricula, and staff salaries to teach gardening concepts that reinforce the beneficial nutrition aspects of gardening are allowable costs. Participants may use program benefits to purchase seeds and plants for individual gardening purposes. FNS encourages State Agencies to coordinate with the Federal, State, local, and private initiatives that create sustainable gardens to benefit schools and communities through collaborative efforts. We can do without the tractors! (We didn’t ask for ’em, anyway.) 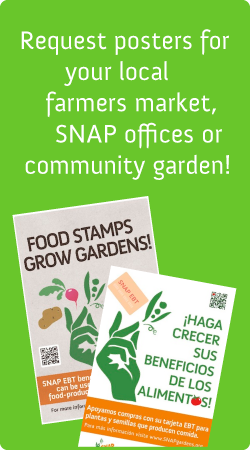 Looks like much better opportunities await for SNAP-Ed partners, SNAP Gardens partners, and of course, for SNAP participants! Stay tuned! This entry was posted in SNAP-ed, USDA. Bookmark the permalink.